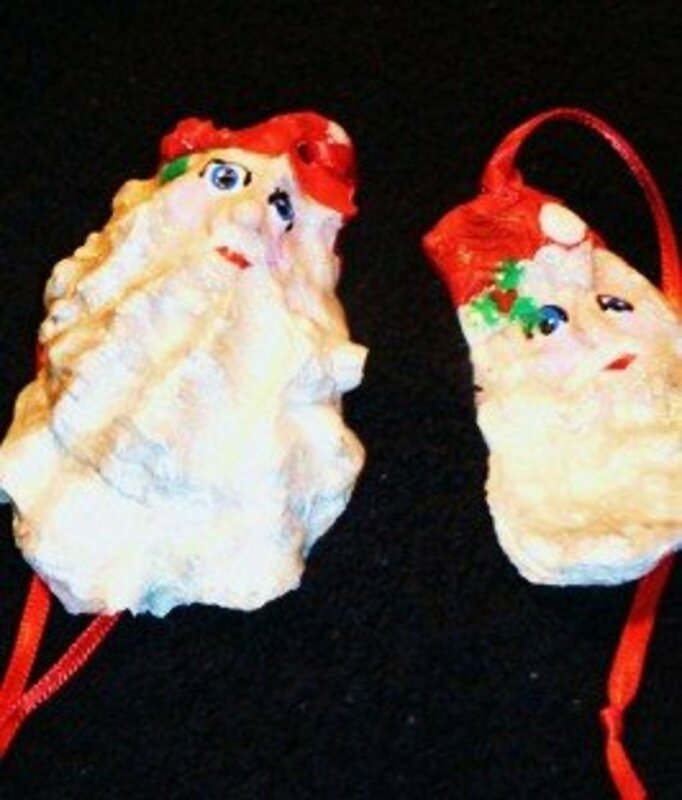 Oyster shell Santa Clause Christmas ornaments are an excellent Christmas craft for kids. Completed ornaments make unique and thoughtful Christmas gifts for Teachers and Grandparents. 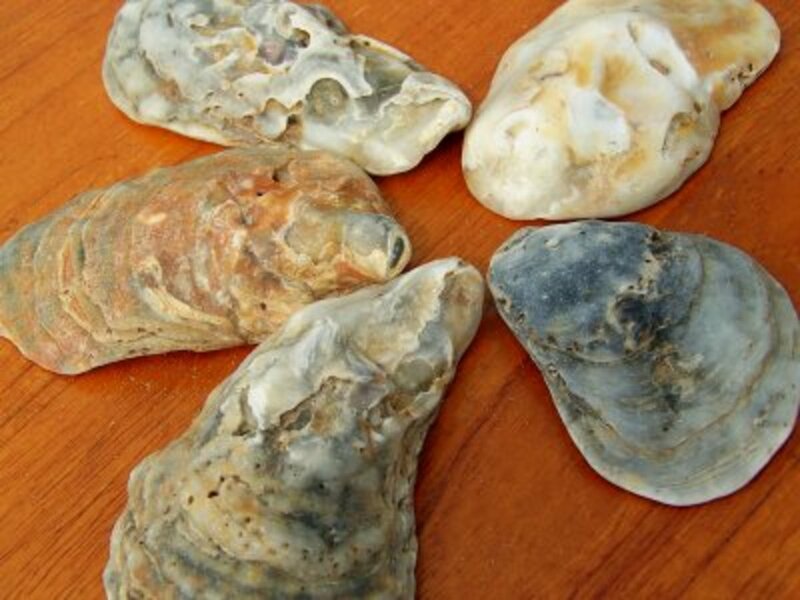 If you have a supply of oyster shells from a beach vacation or a neighboring restaurant, you will only need to purchase a small amount of paint for this project. 1. Scrub all the oyster shells you are using with hot water and dish soap. If any of the shells have any residue or dirt on them, use a toothbrush to scrub it until clean. Let them dry thoroughly. 2. Use the drill to place small holes into the top of each shell so you can add a ribbon for hanging. Make sure to drill the pointiest side of the shell as this will be the top. Ribbon can also be glued to the shell to make a hanger. 3. Paint the pointed top of the shell in red to make Santa's hat. 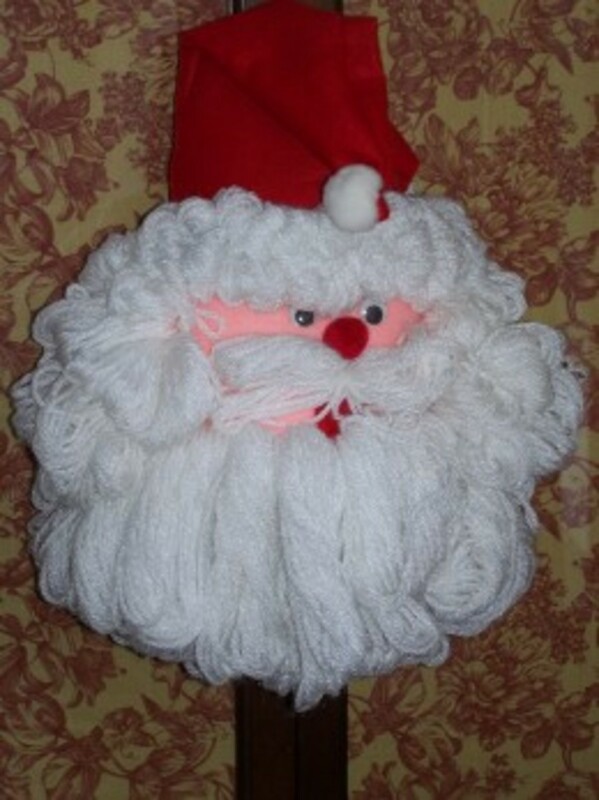 When dry, paint a white ball for a festive jingle or add a cotton craft ball to make a fuzzy topper. 4. Paint the remainder of the shell white and let it dry. 5. Paint a peach or flesh colored oval for the face to match the shape of the shell. 6. Using a tiny paint brush or fine tipped Sharpie, draw or paint details of a face onto the shell. 7. 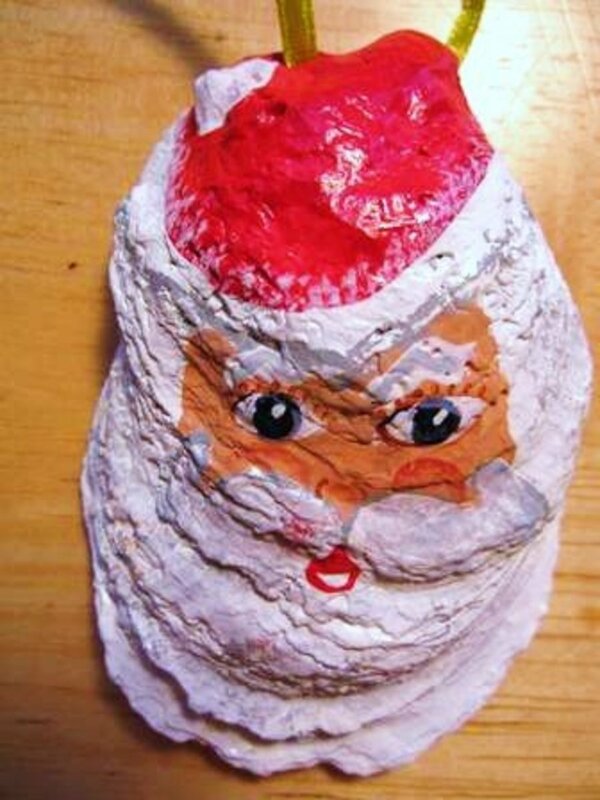 Paint a white moustache onto the shell to finish Santa's face. 8. 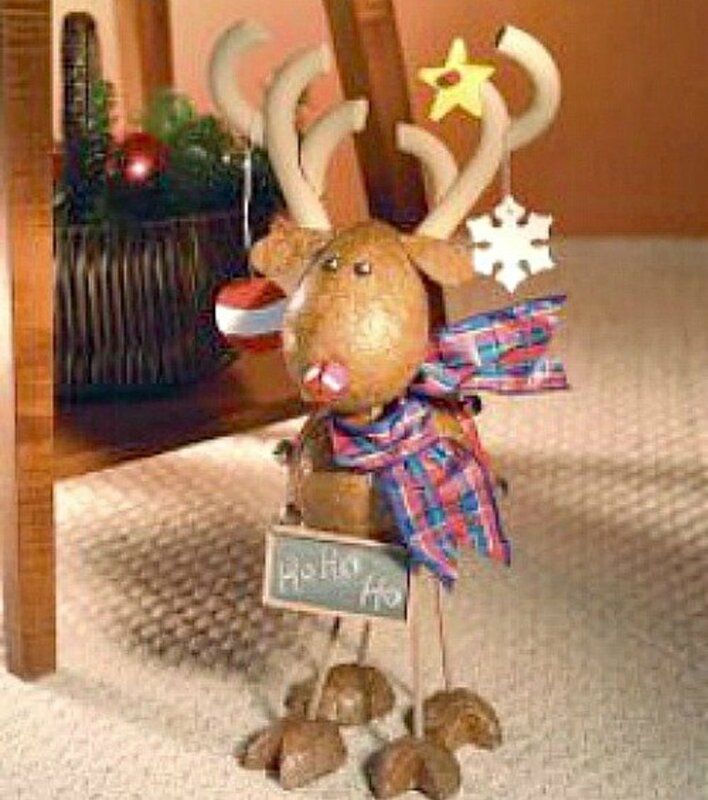 Add a hanger and your oyster shell Santa ornament is ready to enjoy! Using the same supplies, you can easily make oyster shell angel ornaments for your Christmas tree. 3. Paint the entire shell in a white or off white color of angels. Lightly spinkle glitter on the paint while it is still wet for a sparkling angel. 4. Paint a peach or flesh colored oval for the face to match the shape of the shell. 5. Using a tiny paint brush or fine tipped Sharpie, draw or paint details of a face onto the shell. 6. Add wings by gluing lace or ribbon on the backside of the shell. You can add hair or some garland to the angel's head to make a halo. 7. 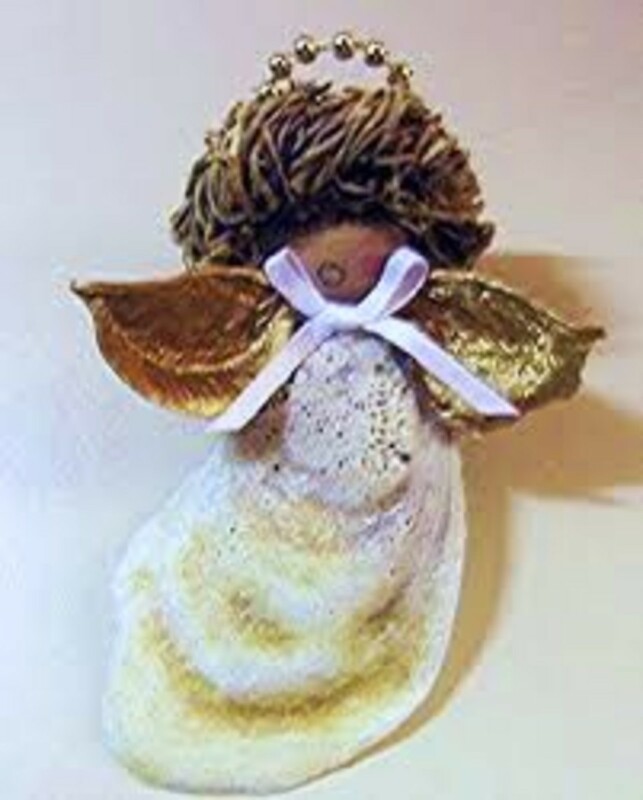 Add a hanger and your oyster shell angel ornament is ready to enjoy! A free crocheting tutorial and pattern to make this lace up lady's boot. A detailed tutorial on how to make wine glass charms or markers. Discussion on the ease and low cost of this craft that is great for home décor or for gift giving. 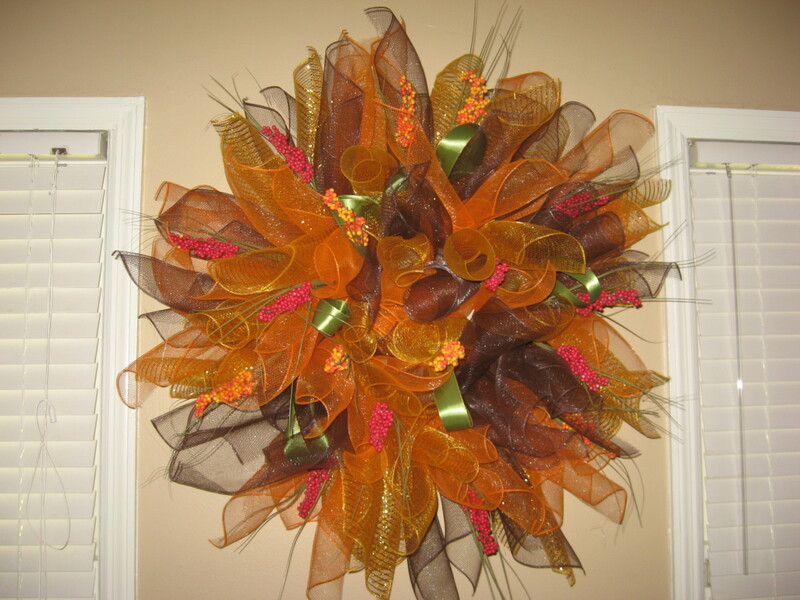 Pretty, gives little kids something to do, and saves money on décor too. Oyster shells are beautiful in themselves as well!! Thanks for the ideas, Tammy. Thanks Written Up! I hope you guys enjoy this craft! Love this idea - I'm always looking for ways to "repurpose" for craft projects. I think the kids would enjoy this - sounds like a lot of fun. Thanks Mary615. I appreciate that! Oh, boy...time to start thinking about Christmas. Thanks for sharing this cute idea. I voted this UP, e tc. I bet those are really cute sgbrown. They are naturally unbreakable and last forever. They make for some awesome memories. Thanks so much for sharing that. Thanks so much Glimmer Twin Fan. My daughter loves making crafts too. Thanks so much for reading and commenting! I am trying to convince Billybuc to get in the shell business. LOL. A person really could make a lot of money on those. There are many landlocked crafters who would love to have them. They don't cost to much online, but the shipping costs are high because they are heavy. I appreciate you stopping by leaving a comment. Thanks for reading Lord De Cross. It would be hard to eat oysters if they had Santa's face on them. Time to start shopping! Thanks so much TToombs. I appreciate that! OK....It's getting pretty obvious...when I can scan past just a picture....and know it's a "Craft" hub written by TAMMY. lol.....I saw those Santas and I stopped to back up..."Oh, looks like Tammy's making something new!! "............Imagine my surprise when I realized, THIS is something I can do!! Yayyyyyyy! I save both clam and oyster shells when we buy them fresh to bring home for dinner.....I wash them and pack them away, because I will make stuffed clams.....and use the shells for this. The oyster shells, I will paint and put around our deck with our plants and flowers, to decorate. What a cute idea. My daughter makes ornaments every year for family. This might be the one for this year. Thanks! Voted up and shared. cheaply, they can cost here so i'l check online too. I used to take all the shells from a restaurant I worked with and was great for all craft things!! Sadly gone now. Voted up, Awesome, Useful. Interesting and sharing ! Great hub!! Another cool idea Tammy. Those Oyster shells look better than the ones I left at the Buffet the other day. Wow! Christmas is 3 months away Omg! Hi Coffee. These shells are pretty small. It would take quite a few to pull on the tree. Thanks for visiting and taking the time to leave a comment! That's really brilliant and cool. Hope it doesn't bring the tree down, or, these oyster Santas can be used as cheery holiday ornaments anywhere at home, too. Magnificent instant Santa beard! Cheers! Pinning and sharing and voting up too! 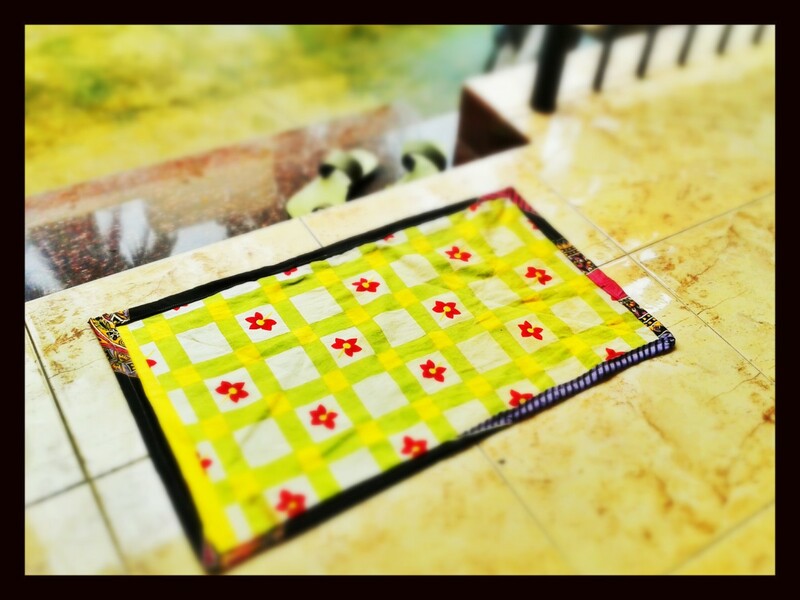 Thanks Mama Kin. I am not a big fan of cheesy either.. or those super cheap foam ornaments that kids make in school. Oye.. Thanks so much. I appreciate your visit! Thanks so much for reading and commenting Spy! Whew!! Tammy, this is very great! what a lovely and gorgeous ideas you have! Thanks for reading alocsin. You can get the oyster shells at the beach, in most craft stores during different seasons of the year, and from the method you described. Thanks so much for stopping by! What a charming idea but the obvious question is where do you get oyster shells? I guess you actually have to buy them from the grocery store, eat them and then use the shell? Voting this Up and Useful. Christmas is my favorite holiday and I love collecting homemade ornaments. This is going on my list as a to-do with the kids this season. Thank you! These are lovely and your pictures are great. I am going to share on pinterest...and of course vote UP. I have a few of these, so adorable! Thanks Billybuc. Even if you don't intend to make these, you could make a lot of money collecting oyster shells, cleaning them and selling them. Many crafters buy these for crafts but many have no access to them. Or, you can send them to the Realhousewife..LOL. Thanks for commenting! Thanks for reading and commenting Realhousewife. If you have a seafood resturaunt in your area, I am sure they would be glad to give you some shells. I appreciate your visit! Thanks so much for taking the time to read and comment Ishwaryaa22! I always appreciate your warm comments. Wow! Double wow! Triple wow! With each creative hub, you tend to amaze me more and more! 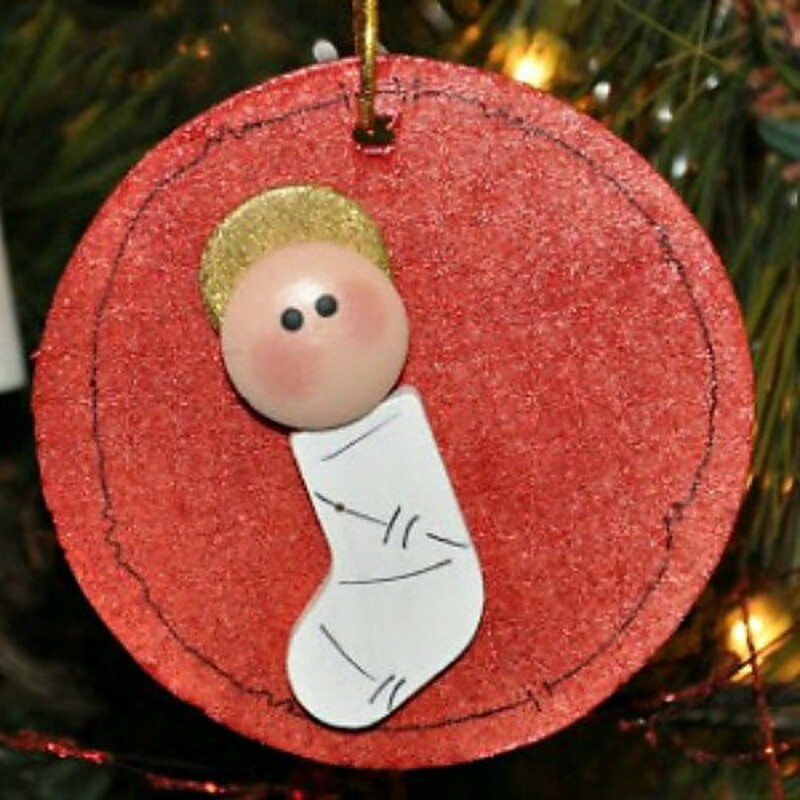 This is an extremely economical and crafty idea!A unique Christmas craft tutorial hub! Well-done! Oh too bad I don't have any around here. I might be able to find some at an art or craft store. This is a great project to keep those girls busy and happy! What a cool idea; we have millions of oyster shells on the beaches here....this looks so simple I could even do it! Thanks Tammy; passing this one to Bev. Very creative as always!